Cities are playing a more and more important role in human economic and cultural development, while also exerting great impacts on the environment. 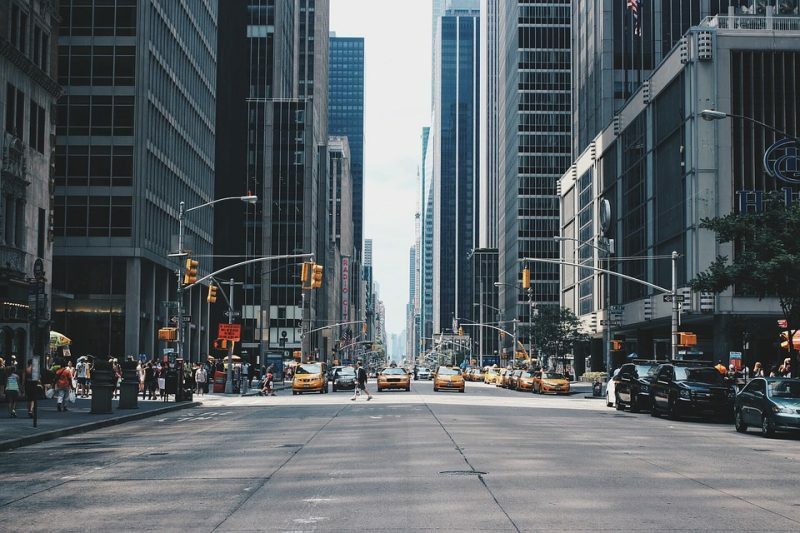 Being able to effectively and accurately evaluate urban problems and monitor the condition of a city will become crucial for future urban planning and management. Many works have attempted to quantify the quality of urban development from various perspectives. But those evaluation frameworks mainly focus on the functionality of cities such as innovation, industrial production, information exchange, economic activities, cultural experiences, etc. The origins of these functionalities, which are the comprising components of a city, have not been explicitly examined from a well-rounded perspective yet. The comprising components of a city include all of the entities in a city such as people, building, roads, wildlife, etc. They should draw particular attention, since all kinds of urban planning and management that aim at functionality end up impacting these components directly. Complex systems like ecosystems and cities are very similar to living organisms. Similar to organisms, cities also have different health status. According to the World Health Organization, human health is defined as a “state of complete physical, mental and social well-being.” Likewise, a healthy city can also be defined as a state of complete demographic, infrastructural, and environmental well-being, which means that all essential components are present with integrity and sufficiency and also function effectively, harmoniously, and sustainably. From a reductionist point of view, a healthy human body is comprised of living cells (which form organs, blood, neurons, etc. ), cell derivatives (such as bones, hairs, hormones, excretes, etc. ), and external inputs (such as food protein, water, vitamins, symbiotic bacteria, etc.). 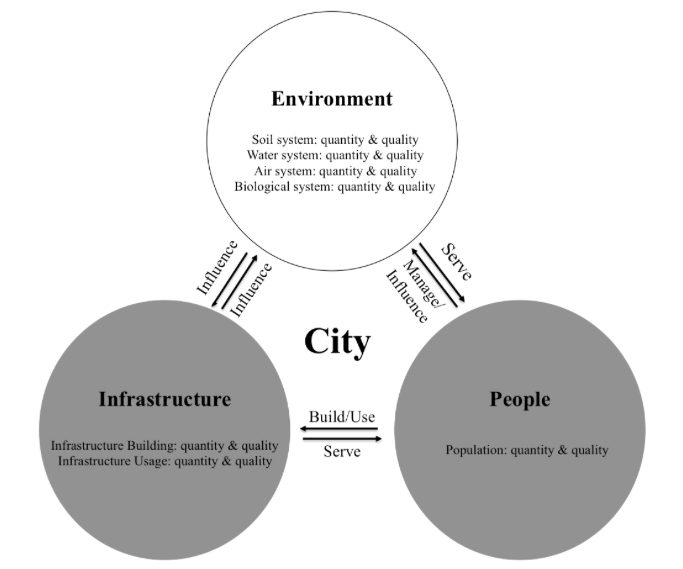 In an analogy to the human body, a healthy city might also be reduced to three basic components, which are People, Infrastructure, and Environment (Fig 1). People, which are the essential elements of any city, are like cells in the human body (i.e. blood cells, skin cells, neurons, etc.). Every urban dweller falls into this category. They are the most important component since all cities are a creation of people. Infrastructures, which refer to anything that is manmade in cities, such as roads, buildings, vehicles, etc., are like cell derivatives (i.e. bones, hair, hormones, etc.). They represent the artifacts that people build and manage in order to live and prosper in a city. Infrastructure can reflect many characteristics of a city such as the stage of development level, urban planning philosophy, city history, and culture, etc. Environment, which refers to anything that is not manmade in a city, such as plants, soil, water, animals, etc., is like all of the external inputs in a human body (i.e. water, vitamins, parasites, etc.). The proper functions of cities rely on the resources and services that provided by the environment. Although people can build systems such as parks, gardens, and lakes in cities, the elements that make up these systems establish themselves through natural processes rather than further anthropogenic forces. The three components can be further divided for detailed evaluation. The health condition of “People” can be examined based on the quantity and quality of urban dwellers. The health evaluation of “Infrastructure” should consider the quantity and quality of both infrastructure building and usage. “Environment” can be further categorized into soil, water, air, and biological systems. The quantity and quality of all these subsystems should be evaluated to reflect the overall health of the Environment in a city. Just like a healthy human being, a healthy city requires that all its internal components and external inputs closely and harmoniously interact with each other. These interactions can be specified as follows: people build and use infrastructures and influence and/or manage urban environments. Infrastructures are built to serve people by providing various services including sheltering, production, trading, transportation, recreation, etc. The construction and usage of infrastructures also influence urban environments through processes such as fragmentation, pollution, microenvironment alternation, etc. Consequently, the urban environments also influence infrastructures through effects such as weathering, building foundation provision, biodegradation, bio-remediation, protection, etc., while also serving people by providing a range of ecosystem services, such as water regulation, air purification, soil retention, noise reduction, recreation, etc. Under this evaluation framework, a total of 27 indicators (seven for People, ten for Infrastructure and ten for Environment) were used to diagnose the health of a city (Table 1). There are twelve and seven indicators selected for assessing the quantity and quality components, respectively. In addition, there are eight indicators chosen for evaluating the quality of interactions between components since they also play an important role in city health. Some of the 27 indicators are positive ones, which means the higher the value, the better; on the other hand, some were negative indicators, which means lower values are preferred. For indicators that might have mixed effects, extreme conditions are considered before assigning a positive or negative category. For instance, although many studies suggested that higher population density could result in higher resource usage efficiency, labor productivity, and lower per capita carbon footprint, compared to extremely low population density, an extremely high population density in a city would still be more likely to cause a decrease in city health due to the higher absolute amount of stresses that people put on Infrastructure and Environment despite the potential higher resource efficiency. Therefore, population density is determined as a negative indicator in our framework. But a high population density should be used as the health reference value in order to reflect the positive effects. Table1: The proposed 27 city health indicators. Similar to the indicators used in human health examination, each indicator used in city health examination also should have a reference health value. These values serve as the indications of the borderline instead of ideal city health conditions. These benchmark values can be determined from a range of sources, including national regulation or official report, relevant research, averaged values from reference cities, tailored local data, and even common sense. These findings are described in the article entitled Examining component-based city health by implementing a fuzzy evaluation approach, recently published in the journal Ecological Indicators. This work was conducted by a team including Shuyao Wu, Delong Li, Xiaoyue Wang, and Shuangcheng Li from Peking University. 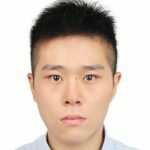 Shuyao Wu is a Ph.D. candidate at Peking University in the College of Urban and Environmental Sciences. His research focuses on restoration ecology, forest ecology, landscape ecology, physical geography, urban forestry, and ecosystem services.